"Wouxun seems to be finalizing an enhanced version of the KG-UVD1p, a KG-UV6D. The current UV 2 and 3 models are generally considered as slight variations of the UVD1p model including slight case cosmetics and/or a software feature or two. Having a chance to see the draft manual of the new model a couple features come to mind. 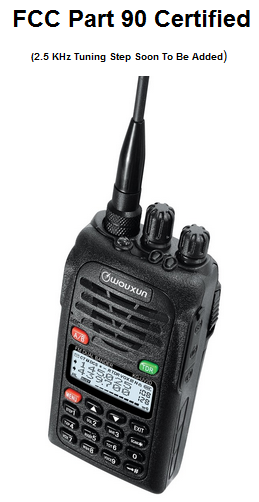 The KG-UV6D, among other features, includes the 2.5khz frequency step, 199 channels, and boot up message ability. The case form factor is very similar to the current model. I am not certain of the expected release or availability dates for this new version. Perhaps one of the "Ed's" wants to chime in." Emphasis is mine to point out the changes. Anyone surprised that we would see this before the mobile? Not anymore: Powerwerx $174. !